Description: Economics is the study of decision making under conditions of scarcity. This course looks at the behavior of the individual consumer and firm and their interaction with the government. The second half of the course studies the macroeconomy and focuses on the causes of inflation, unemployment, and interest rate changes. The international economy also will be studied. No credit for economics majors. Description: A principles of economics course designed for future elementary and social studies teachers. The purpose of this course is to: 1) introduce the future teacher to basic economic concepts required by the Indiana Academic Standards for Social Studies, K-6, 2) learn methods for teaching these concepts in the K-6 curriculum, and 3) develop a catalog of curriculum materials appropriate for teaching economics in grades K-6. No credit for economics majors. Description: Upon completion of this course students will be able to analyze economic events in order to make more intelligent choices as consumers, workers, and voting citizens; identify and understand the basic concepts and principles of economics in order to meet standards at the secondary school level; identify supplemental materials and programs from variety of sources used in your teaching major, minor, or as supplements in your classrooms; and review and organize lessons that teach economic concepts. No credit for management students. The course content is principles-level economics and is designed for social studies education students who are beginning their sequence of required economics courses. The course is designed to be taken before upper-division economic content courses. No credit for economics majors. Description: This is a course in the principles of microeconomic theory. In this course, students study the choices individuals make and the incentives that influence those choices. Emphasis is on the incentives that determine market prices and resource allocation. The role of public policy in influencing incentives and efficiency is also addressed. Description: This course is intended for Honors College students in any major. The work load is heavier than in a regular ECON 251 class, so students need to be willing to allocate additional time and effort this this course. Description: This is a course in the principles of macroeconomic theory. The course develops a theoretical framework permitting an analysis of the forces affecting national income, employment, interest rates, and the rate of inflation. Emphasis is placed upon the role of government fiscal and monetary policy in promoting economic growth and stable prices. Description: The application of economic analysis and common nonmathematical models to managerial decisions. Topics include decisions involving time and uncertainty in both competitive and noncompetitive markets. Pricing decisions are emphasized. No credit for economics majors. Covers material similar to ECON 34000. Course number was previously ECON 41900. Description: This class applies economic principles to the professional sports entertainment industry and its derivative input markets. The class begins by examining the microeconomics of demand for (by fans) and supply of (by teams) sports entertainment. The labor markets for the primary input, athletic talent, receive significant attention. Coordination among economic agents, taking the forms of leagues, players' unions, and government, is considered at the end of the class, with an emphasis on how they affect the efficiency of the markets related to sports entertainment. Quantitative empirical analysis is emphasized throughout the class. This is not a sports trivia or fantasy sports strategy class. Description: Topics from consumer behavior and demand, production and cost, factor demand, market structure, strategic behavior, and game theory. Emphasis on the tools used to analyze the behavior of individual economic units. Covers material similar to ECON 51100. Description: A rigorous, general equilibrium treatment of macroeconomic theory with emphasis on the components of the macroeconomic model: determinants of consumption, investment, net exports and foreign exchange rates, the level of unemployment, inflation and the long-run rate of economic growth. Covers material similar to ECON 51200. Description: This course examines the statistical techniques used to analyze economic data, estimate causal effects, make predictions, and test economic theory. Students learn empirical skills used in analytical consulting, financial modeling, economic research, and by analysts in the private and public sectors. Emphasis is placed on estimating a single equation (e.g., a demand function) and the problems associated with such estimation. As part of the course, students will estimate equations using statistical software available. Covers material similar to ECON 56200. Description: The course studies the influence of laws and regulations on the behavior of firms, focusing on two types of government intervention in the market: antitrust law and economic regulation. Antitrust laws define the rules by which firms must compete. Economic regulation more tightly constrains the actions of firms, requiring that they obtain approval to set prices and/or enter new markets. The focus is on current topics in both areas, including comparison of U.S. practice with that of the European Union and elsewhere. Description: This course is designed to introduce upper level undergraduate students in economics to the field of health economics. We will analyze health and health care theories, institutions, and key policy issues. The course covers how the markets for health and health care services are different from other goods, with a particular emphasis on the role of government and market failure. We will examine the demand for and the production of good health, and the behavior and organization of health care providers. We will also explore the functioning of health insurance markets. We will consider health care systems around the world, paying particular attention to the U.S. health care system and recent reforms to it. Description: Modern economic theory has roots in antiquity, in early efforts by social philosophers motivated by belief in natural law - to discover and explain the underlying forces that shape individual and collective behavior. With the emergence of classical thinkers led by Adam Smith - in the eighteenth century came efforts to firmly establish economics as a systematic inquiry into the determination of the wealth of nations. Later, as we move to the nineteenth century, the foundations of much of modern microeconomic theory consumer demand, production and cost, profit maximization, etc. were laid. Economics became a science. It is this evolution of the subject that is explored in this class. Description: It has become increasingly clear to economists, legal scholars and political scientists that it is impossible to understand economic institutions without first having an understanding of the legal framework within which they operate. Similarly, it is impossible to understand the impact of law on society without first having an understanding of economic principles. This problem is further complicated by the fact that there are often ambiguities in the written law that lead to significant differences between what the law appears to say and how the law is interpreted in the courts. This course is designed to give the student an understanding of both legal and economic principles and the relationship between them. Finally, through the use of economic analysis, the student will acquire the tools to predict the likely outcomes of particular laws and how they will affect their family and business decisions. Description: Develops an understanding of the economics of globalization, including the movement of goods, people, capital, and ideas across countries. Using the tools of intermediate economic theory, we discuss the benefits and costs of globalization, the implications of globalization for wages, earnings and national welfare, and their intersection with government policies. Description: The goal of the course is to give you an understanding of the background to and current economic structure of the European Union, as well as the economic challenges it is now facing. Description: The course analyzes the economics of money, monetary systems, investments, and financial intermediaries in modern industrial economies. Topics considered include the origin of money and the banking industry, financial asset markets, the role of central banks, and the effects of various monetary policies. The theory will be presented side by side with current economic and financial news, and the students will learn how to track financial and economic data via The Wall Street Journal. Description: The purpose of this course is to introduce important topics, theories, institutions, and policy issues relating to the functioning of labor markets. Topics to be considered include labor supply decisions, investments in human capital, compensating wage differentials, labor contract theory, unions, compensation programs, signaling in labor markets, the economics of unemployment, and government employment, retirement, and workplace safety. Description: The pursuit of happiness and prosperity leads naturally to the creation of markets where individuals trade goods and services. In order for there to be orderly trade, we must agree to a set of rules that regulate our behavior. The resulting social contract defines (and is enforced by) our chosen form of government. Some rules encourage individuals to be more productive, leading to an increase in wealth and prosperity. Some rules will have the opposite effect, discouraging production and leading to an increase in poverty. We will discover that the emergence and outcome of selected rules is predictable once we understand the role played by individual incentives. Description: The application of economic analysis and common nonmathematical models to managerial decisions. Topics include decisions involving time and uncertainty in both competitive and noncompetitive markets. Pricing decisions are emphasized. No credit for economics majors. Covers material similar to ECON 34000. Course number change to ECON 30100 for fall 2017. Description: In this course we study of the role of government in market economies. The aim of the course is to provide an understanding of the reasons for government intervention in the economy, its financing via taxation, and how individuals respond to government action. Emphasis is placed on current U.S. policy issues including environmental policy, Social Security, education policy, welfare programs, and healthcare. Description: In the course, economic, political, and social interactions are represented as games, in which strategies and resulting outcomes can be analyzed. The analysis of these interactions is then used to demonstrate how one can make optimal decisions under uncertainty. Description: This course combines theory and empirical evidence to analyze macroeconomic trends and policy questions in closed economies. Students will use state-of-the-art macroeconomic models along with Federal Reserve data and the model-solving software Dynare to make predictions about economic outcomes for a variety of policy changes. Description: This course examines the determinants of firm and market structure and the resulting market performance in imperfectly-competitive markets. Advanced topics include advertising, research and development, imperfectly competitive international markets, and market integration. Emphasis is placed on using theoretical models of firm and industry behavior to explain and analyze real-world examples of firm behavior. Description: Analyzes topics in international economics, using more advantage techniques and more detailed treatment than in ECON 370 or 371. While coverage varies somewhat with instructor, some topics could include: economic growth, innovation and technology transfer, and the role of multinational corporations. Description: Students learn about human behavior in economic environments, with a strong emphasis on classroom laboratory exercises. Topics considered include behavior in a variety of markets - for example, markets with price controls, markets for financial assets and auction markets -- and behavior in social dilemmas that arise when people try to provide public goods voluntarily or when sellers try to conspire to fix prices. Students will also learn how people bargain with, trust each other, and show social preferences towards others. Decision-making and anomalies for risky and uncertain choices will also be covered. Description:This course focuses on quantifying the extent of, and determining the underlying causes of racial and gender disparities in the labor market. Topics include the impact of prejudice on labor market outcomes, statistical discrimination, early childhood factors and differences in environment, and fertility and reproductive technology. Description: Execution by economics honors students of a senior honors thesis under the direction and supervision of the faculty. In addition to a paper, completion of the research project may involve the presentation of the findings in a seminar or workshop setting. Description: Consumer behavior and demand, production and cost, factor demand, market structure, general equilibrium and welfare. Emphasis on the tools used to analyze the behavior of individual economic units. Not open to students with credit in ECON 34000. Description: Course content includes money and banking, national income and aggregative economics; the analysis of the determination of national income, employment, the price level, and the balance of payments. Consideration of both theory and economic policy. Not open to students with credit in ECON 35200. Description:This course in econometrics covers the tools that will enable students to conduct empirical analysis using economics data. 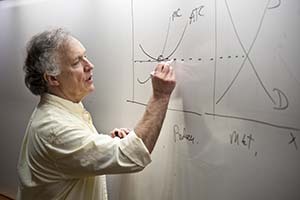 The course examines the statistical techniques used in testing economic theories, estimating casual effects, and making predictions. Emphasis is placed on estimating a single equation (e.g., a demand function) and the problems associated with such estimation. As part of the course, students will estimate equations using STATA, a statistical software package. Not open to students with credit in ECON 36000.